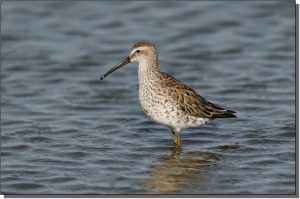 Description: This robin-sized sandpiper has a long neck; long, greenish legs; and a droopy, black bill with a thick base. Stilt Sandpipers feed in a characteristic rapid, sewing machine-like fashion in relatively deep water. During the breeding season, they are heavily patterned, appearing “tigerstriped.” They have a distinctive reddish crown with a white central stripe, rufous lores and ear coverts and a strong, white supercilium. The leg color, dark eye stripe and white supercilium are maintained during the nonbreeding season when birds are a basic gray-brown with dark breast streaking. 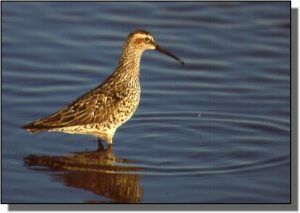 Similar Species: Dowitchers appear similar but are bulkier, with a longer, straighter bill. Yellowlegs lack the side streaking and head pattern and have richer, yellow legs. Comments: Stilt Sandpipers breed on the low arctic tundra and are highly site faithful, even returning to the same nest cup used in a previous year. This species is seen in the Great Plains during both spring and fall migration.